"Freezing to death" is actually a misnomer, since humans begin to die of cold if their core temperature drops below a summery 85, long before ice crystals form. But it's too common an error to hope to correct now, and with the Chicago area expected to be plunged into a hellish 20 below zero—the high for Wednesday is predicted to be a record 14 below—this seems an apt moment, among the warnings to stay indoors (my plan) or bundle up in layers if necessity or foolishness lures you outside, to give careful consideration to the long tradition of fatal cold, and the rich literature it has inspired. "Hellish" for instance, was not a casually chosen adjective. 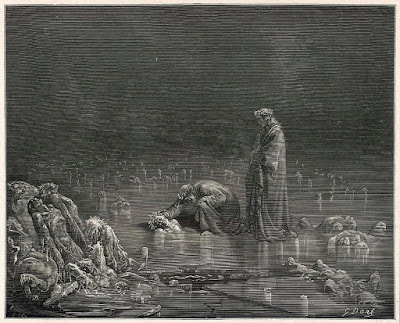 Despite its famous flames, Hell is often frozen in Dante's travelogue. In the 9th circle, he comes upon figures encased in ice, describing a scene that will no doubt be reproduced on CTA platforms citywide today: "I saw a thousand faces after that/All purple as a dog's lips from the frost/I still shiver, and always will, at the sight." And in the lowest pit of Hell, Satan himself is buried to his chest in ice. But those people are mostly fictional. Browsing over a century plus of Chicago deep freeze death reports, those real souls most apt to die from cold tend to fall into broad categories: the old, the poor, the old and poor The impaired, typically drunk. The mentally impaired are also vulnerable—in January, 1979, two 8-year-old boys boys, clad only in their pajamas, slipped out of the Joseph P. Kennedy School for Exceptional Children in Palos Township, were locked outside and froze to death on the stoop. It was 5 degrees below zero. Nor where they the only state charges to die that year. Hypothermia as a form of suicide is not unknown. In 1898, Maud Alexander, 30, "concealed herself in the dark entrance of the vacant Horse and Harness Exchange building, 1633 Wabash avenue, last evening, and sought to freeze to death," according to a report in the Tribune. "I want to die," she told the policeman who discovered her and saved her life, explaining that she was "friendless and had no money." About 25 people die in Cook County every year from exposure to cold. According to the Centers for Disease Control, Illinois is in the top five states for number of cold deaths, though ranks 15th per 100,000 people. About 1,300 people die a year of hypothermia in the United States, 2/3 of those being men, since men are more prone to impairment from substances and what is considered an adventurous spirit. Except far more people will die from extreme hot weather than from this cold weather. Most can bundle up & stay warm, as your body does produce heat, but at some point, you can't take off your skin to cool off. Don't forget, until after WWII, the South was lightly populated & had little in manufacturing, because it was just too hot there for most factories. Most homes had summer kitchens, which were outside, so they didn't heat the house up even more. The people in the mining town of Coober Pedy Australia live underground, as it's far too hot to live outside there! At least it's nice and sunny today. I can open the blinds on my south-facing patio door and window, which may reduce the load on my furnace a tiny bit. I used to volunteer at a local homeless shelter (had to quit when I got a full-time job). I'm thinking of those people and how much I liked most of them, and how lucky I am to have a patio door and window, and a furnace. Very true. It is sad to see homeless people with missing fingers, and/or hobbling about because toes have been amputated. Frozen Alive. It's almost as gripping as "To Build a Fire". This might seem crazy, but before I realized what that image was...a vision of a frozen Hell, I thought it was a 1912 editorial cartoon about the sinking of the Titanic. After the sinking, hundreds of passengers and crew were left dying in the icy sea, surrounded by debris from the ship. That's what I thought all those little pieces were. Or maybe chunks of ice. And those two figures on the ice? 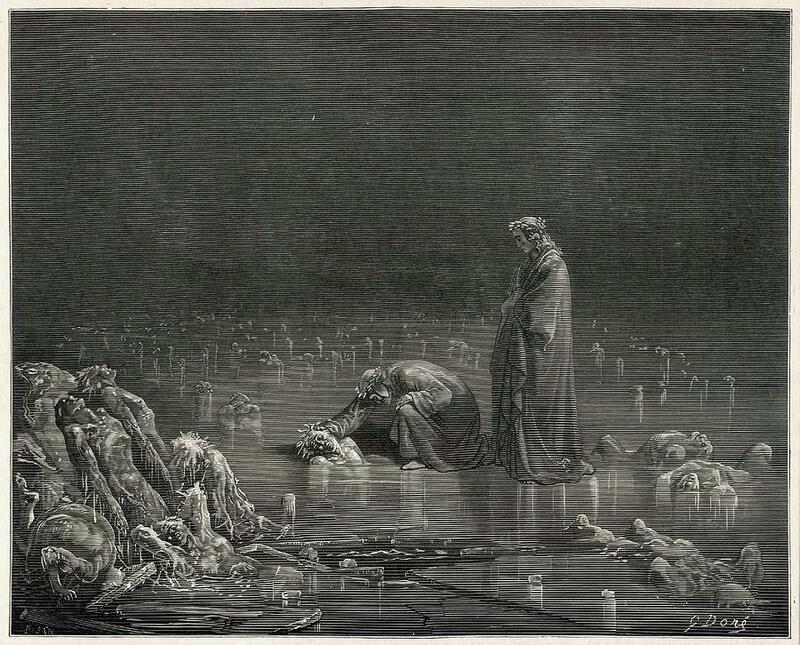 They were angels inspecting the dead. No, I wasn't smoking anything. It was just me. With a temperature of 28 °F , the water was cold enough to cause death within fifteen to thirty minutes. The 1997 movie attempted to portray the horrors that the survivors saw and heard, but probably didn't come anywhere near the awful reality of it. I was still in grammar school when the Our Lady of Angels fire occurred (I was the same age as many of the victims, and my old neighborhood was only about a mile away), so for me, the idea of death by fire has always been innumerable times worse than the thought of freezing to death. The quote from Capt. Zely is an example of a little known phenomenon that many people near the point of death from the cold begin to feel hot, very hot, so hot that they strip off all their clothes to cool themselves, so that their deaths are sometimes wrongly ascribed to suicide. Of course, we’ve all felt that pins and needles pain while warming our hands or feet after exposure, but the full body experience must really be hellish agony.